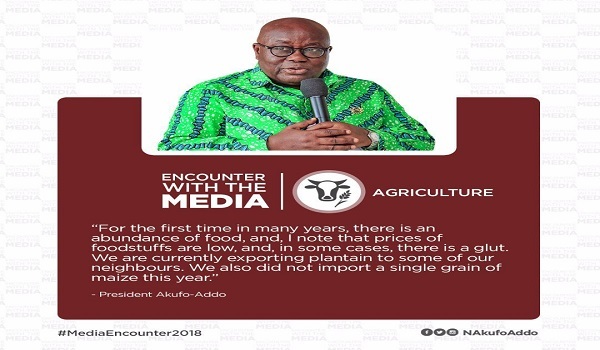 The President of the Republic of Ghana on December 19, met with the press to answer question from the people of Ghana on the general development of the country. Welcome, once again, ladies and gentlemen of the media, to Jubilee House, the seat of our nation’s Presidency. We almost missed our promised rendezvous of, at least, two press conferences in a year, but we have made it, and, as the saying goes, better late than never. We have all been busy. I know I have been busy, but not too busy to know that, thanks to technology, you are all able to track my activities every day and, often, in real time. I wonder, therefore, if there is any harm done if we are not able to get around to a formal gathering such as this often, but, nonetheless, I am glad that we are all gathered here, as I intend to hold to my promise. At this time of the year, I should start by wishing all of you a Merry Christmas and a happy and prosperous New Year. So, let us get on to the business of our gathering. I am happy to report that I have paid a working visit to all ten regions within the year, as I did in my first year, and plan to do every year of my mandate. I like Jubilee House, I fought long and hard to get an office here, but I have to admit it is always invigorating to go out and meet the people in their own communities. Nothing beats seeing and hearing things for yourself. For example, going around the country means that I know at first hand that many of our roads are in a bad state. But that is not a new discovery to me, the distressing deficit in our infrastructure has been a running sore for our country for ages, despite the invisible, unprecedented infrastructural developments of yesteryear. I know that we need to open up our country, build roads, bridges, airports, railways and make it easy for the people and goods to move around. This infrastructure deficit poses the biggest challenge in trying to deal with our development needs. I am glad to be able to report that we have started on a comprehensive programme to tackle this problem. Ladies and gentlemen, we are resurrecting the railways. The existing narrow-gauge network, which had almost disappeared, and led to a generation of young Ghanaians hardly knowing about railways, is coming alive. Rehabilitation work on the fifty-six (56) kilometre narrow gauge line from Kojokrom to Tarkwa through Nsuta is nearing completion. This will lead to the restoration of passenger rail services from Tarkwa to Takoradi for the first time since 2007. The freight service from the manganese mine at Nsuta to Takoradi is in operation, and the ongoing rehabilitation has also led to a spectacular reduction in the number of derailments and incidents that occur on the line. When I went to see the works on the railway lines for myself, I was particularly touched by the enthusiasm of the workers. The Ghana Railway Company Limited, with its own workforce, started rehabilitation works on the seventy point eight (70.8) kilometre narrow gauge section of the Eastern Railway Line from Accra to Nsawam and Accra to Tema. They did not have or need any foreign experts, so-called, they had the expertise, and those who did not were ready to learn, and they certainly had enough enthusiasm to carry them through. 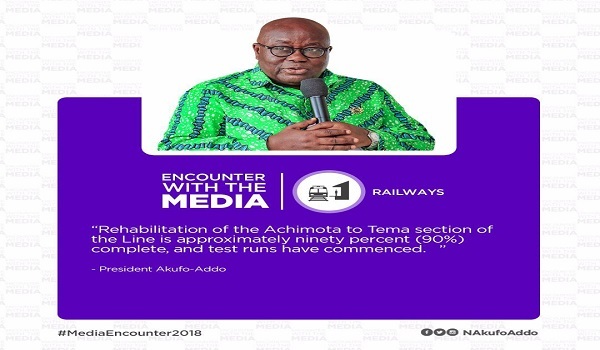 Rehabilitation of the Achimota to Tema section of the Line is approximately ninety percent (90%) complete, and test runs have commenced. Work is ongoing on the Achimota to Accra Central section of the line and the Achimota to Nsawam section, and I have been assured that this will be completed before the end of the year. Ten (10) existing passenger coaches have also been refurbished, ready to be pressed into action when commuter services re-open on this line. We are not only rehabilitating the old narrow-gauge line. I am happy to report that the procurement process is far advanced to develop a new standard gauge line for the Eastern Railway Line and others for us to have a network that covers the whole country. A major difficulty, which could slow down the work of this exciting development, is the nuisance posed by encroachers. I want to take this opportunity to appeal, again, to all citizens to join in and be part of this exciting development, and not place any hindrances in the path of bringing modern railways to our country. There is excitement and a lot of activity in the aviation sector, and it is good to note the entry of two new private airlines offering services along the domestic routes. We welcome the competition, as this, already, is bringing down the prices for customers. Terminal 3, at Kotoka International Airport, is open for business and attracting a lot of positive comments. I expect that the managers of this facility will maintain it at the highest standards. The airports at Ho and Wa are ready, and we await the commercial flights that have been promised. If the railways and aviation sectors are causing excitement, I believe I can promise that there will be even greater excitement when work on repairing and building many roads around the country intensifies. Ladies and gentlemen, the Sino-Hydro project is about to take off. This two billion US dollar barter deal that we have negotiated with China should bring a dramatic and very welcome change to our infrastructure developments, especially in the roads sector. The roads that are going to be tackled first, under the facility, have been enumerated, and they should make a great and immediate difference to the lives of many people. The first $650 million worth of projects has been approved by Parliament, and are ready for execution. It is now up to our professionals, who would be supervising and working on the projects, to make sure that we get value for money. I am aware that there is some anxiety among some people that we might be putting ourselves in a position of too much dependency on China. Ladies and gentlemen, for far too long, the lack of money has hampered our development and dampened our self-confidence. I am determined that we should use what opportunities there are to raise ourselves out of poverty, but there is no chance that I would ever preside over the loss of Ghana’s sovereignty to any foreign country. The settlement of our obligation is through the supply of aluminium products to China. We have resisted any attempt to export the raw material for the settlement. That is why we have established the Ghana Integrated Aluminum Development Corporation, a statutory corporation, to take charge of the development of the full value chain of our bauxite resources. The Corporation is ready to begin work. Not only is this an innovative way to undertake our infrastructure development, but it also enables us to establish an industry with a metal, which is described as the metal of the future, and which can be a major catalyst for our industrialisation. In the almost two years that we have been privileged to run the affairs of our country, everything we have done has been aimed at building a strong economy. A month ago, the Minister for Finance went to Parliament and gave us a candid view of the state of affairs of the economy. He presented a compelling picture, one of hope, because it is clear that, now, as a result of our policies, the fundamentals of our economy are in the right place. The foundation has been laid for the rapid growth and development we expect next year and succeeding years. The 2019 budget focuses on six strategic pillars: entrepreneurship, infrastructure, industrialization, social intervention, agricultural modernization and improving efficiency in revenue mobilization. Available data up to the end of September 2018, indicates that Ghana’s economic health is in good shape. Headline and core inflation generally trended downwards in 2018. Headline inflation dropped to 9.3 per cent in November 2018, down from the 11.8 percent in December 2017. In real terms, growth of credit to the private sector showed a strong recovery registering a growth of 6.8 percent in September 2018, compared to a contraction of 2.3 percent in September 2017. Interest rates eased downward in line with the reduction in the Monetary Policy Rate. The interbank weighted average lending rate declined by 4.71 percent to 16.23 percent between September 2017 and September 2018. Treasury securities also declined over the period, in other words, the fundamentals are all pointing in the right direction. Even though there is little doubt that salaries and wages continue to be low, an increase in income levels can only come about by the expansion and growth of the economy, and that is exactly what we are working to achieve. I am confident that there will be welcome news on that front soon. It is, also, quite clear that, when it comes to the expenditure pattern in our public finances, we are not doing that well. Public sector salaries and wages are still taking too large a percentage of our public sector finances, and that is why there is never enough money left for us to finance all the things we need to do. Revenue mobilisation is still inadequate. Not enough people are paying taxes or paying at the proper rate, and too much economic activity still takes place without any formal records. The government has put in place many measures to formalise and modernise our economy. It is the fairest and fastest way to achieve what we all aspire to. The introduction of the paperless operations at the port, the interoperability of mobile money transactions, the National Identity Card rollout, e-business registration system, and access to digital financial services are all part of the drive to formalise our economy, and enhance its productivity. A critical element is the National Digital Property Addressing System (NDPAS), which aims to generate digital addresses for individuals and commercial properties and also provide navigation capabilities that helps with the ease of finding locations. The system has already attained some milestones. There are 1.2 million registered and verified addresses. 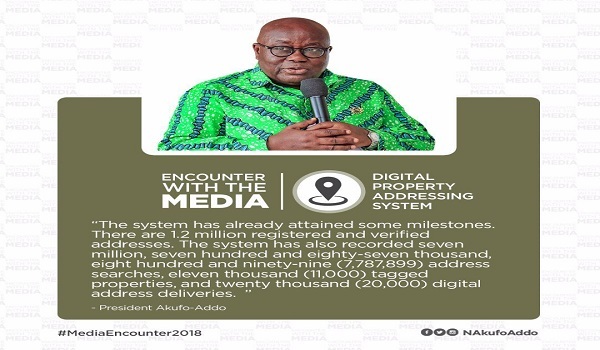 The system has also recorded seven million, seven hundred and eighty-seven thousand, eight hundred and ninety-nine (7,787,899) address searches, eleven thousand (11,000) tagged properties, and twenty thousand (20,000) digital address deliveries. I project that we can find addresses without resort to the second turn on the left after the blue kiosk, and that the banks should be able to lend money to the private sector at much lower rates. Verifiable addresses should come with lower interest rates. Ladies and gentlemen, we expect that the digitization process will help ease the problems that come with our land tenure system, and investors can lease and acquire title to lands without the fear of having to litigate in the courts for years over the same piece of land that had been sold allegedly to many other people. Speaking about land leads me, inexorably, to the physical state of our lands and water bodies. Last Friday, that high-minded public servant, the world-acclaimed Ghanaian scientist, Prof. Kwabena Frimpong-Boateng, Chairperson of the Government Inter-Ministerial Committee on Small-Scale Mining, announced the measures that Government is undertaking to regularise the mining sector and enforce mining laws. He indicated, inter alia, the circumstances under which the ban on legitimate small-scale mining has been lifted. Let me reiterate here clearly that the ban on galamsey, i.e. illegal mining, has not been lifted, and will not be lifted. Some of our media collaborators in the fight against galamsey have, in response to this announcement, expressed their dismay at what they see as the government having lost the will to fight galamsey. The ban on small-scale mining was never intended to be permanent. It was to enable Government fashion a policy that would sanitise the sector, and ensure that, in future, small-scale mining, which has been with us for centuries, would not damage our environment. The measures announced last Friday do exactly that. I cannot, and will not, give up on the fight to protect our environment. I entreat the media and all well-intentioned Ghanaians to continue to join the fight to protect our lands and water bodies. Ladies and gentlemen, the protection of the environment is uppermost in our considerations as we seek to bring rapid development to the people. One thousand (1,000) units of 10-seater water closet institutional toilets with mechanized boreholes are currently under construction around the country, and so are one thousand (1,000) community-based limited solar powered mechanized water systems. Each constituency is getting a minimum of three of these institutional toilets and water systems under the Special Development Initiatives and the Development Authorities. I notice that there is room for constituency priority infrastructure needs, under which the constituencies pick what they identify as their priority need. I believe there is a lesson in there for all of us by simply taking a look at the diversity of priority needs: community centres, police posts, street lights, culverts etc. The procurement process will enable every constituency to get one ambulance each in the early part of next year. This will not solve the ambulance problem immediately, but it certainly shows more commitment to finding a solution than we have ever seen. Lots of things are happening in the health sector, including the fact that this government has paid up the GH¢1.2 billion arrears we inherited, and brought the operations of the NHIS back to life. We are also in the process of launching the world’s largest and most advanced medical drone delivery network. The four (4) distribution centres, from where the drones will be operating, will stock one hundred and forty-eight (148) lifesaving and essential medical supplies, and not only blood. The drone delivery service will save lives, decrease wastage in the system, guarantee healthcare access for more than 14 million people nationwide, and employ over two hundred (200) Ghanaians. This programme is NOT going to be run on the public budget. Corporate Social Responsibility contributions from private sector players will pay for the service. I prefer drones flying to deliver essential medicines to our people than an investment in guinea fowls that allegedly fly off to Burkina Faso without any trace. In all we do, we want to ensure that health officials are well-trained, reasonably content with their conditions, and are able to practice their profession, so we can all have the confidence to entrust our lives into their hands. The prosperity we seek for our people can only be attained when our people are healthy. Ladies and gentlemen, for the first time in many years, there is an abundance of food, and, I note that prices of foodstuffs are low, and, in some cases, there is a glut. We are currently exporting plantain to some of our neighbours. Quite a turnaround from when I was lamenting two years ago that we were importing plantains from Cote d’Ivoire. We also did not import a single grain of maize this year. It is not often we have such good news, and it must mean if you invest in agriculture, you get results. “Planting for Food and Jobs” is working, and I look forward to rice joining the list of foodstuffs we are no longer importing. I also look forward to meat and fish becoming abundant under the “Rearing for Food and Jobs” programme, and our farmers being rich and satisfied with their lot in life. I encourage all of us to look on farming as the serious business that it is. Radical measures are being taken to establish a solid infrastructure for agriculture – the imminent availability of significant numbers of tractors and the enhancement of Agricultural Mechanisation Centres, the construction of 80 warehouses this year for the storage of surplus food, the revival of the National Food and Buffer Stock Company, and the recent establishment of the Commodities Exchange. All these are being done to modernize and transform Ghanaian agriculture to serve as a major growth pole for the economy. Despite the dramatic decline in the world market prices for cocoa, we maintained the producer price paid to farmers as a sign of our commitment to them. We are on course to realizing the 1 million tonne mark for our cocoa production, and seeing to the increasing domestic processing of the product. Our alliance with Cote d’Ivoire, to change the dynamics of the global cocoa industry, is also on course to enable us, the producers, obtain an increasing share of the industry’s value chain. It is good news for our farmers. One of the highlights of my year was sitting through a morning of what we called the Presidential Pitch, where young people who had been trained to turn their entrepreneurial ideas into businesses, made presentations. I felt pleased and happy that the future was bright for our country. The entrepreneurial spirit is growing among the youth and that has to be good. It is also being manifested in the fact that we are paying greater attention to technical and vocational subjects in schools and training institutions, and encouraging those who want to pursue such trades and professions. Free SHS gets all the headlines, but I encourage you to look at all the other interesting and dynamic new things that are happening in Education in our country. Of course, Free SHS deserves to get the headlines; we have held our nerves and Ghanaians have come to accept that every child deserves a secondary education. We have not got enough classrooms or desks or laboratories or computers or dormitories, but children, once born, cannot wait until we get enough Prempeh Colleges and Holy Childs around the country before they can attend secondary school. In addressing this issue, Government, with ingenuity and innovation, has, through the Ghana Education Trust Fund, secured a $1.5 billion facility to help develop infrastructure in our schools. Parliamentary approval has been obtained, and the first tranche of this facility will be used to build more classroom blocks and dormitories in our schools to give our schools appropriate facilities to meet the demands of the 21st century. And, so, we are on doubletrack, and we are building the classrooms and laboratories, and gradually turning the once deprived schools into well-equipped ones. We find that paying attention to the proper management of schools means we are getting better results. The area to show the results, really, would be when school is over and we see the quality of products that emerge. Would we have the literate, numerate and well-trained workforce that Ghana needs to be able to compete on the world stage? As we have been making our voices heard on the international stage, some countries are beginning to take a chance on us. It is not every day that Volkswagen, Nissan and Sino-Truck offer to build assembly plants in your country round about the same time. We would have to demonstrate through our expertise, our work culture and attitude that they have taken the right decision. Systematically, we are also rolling out our 1-District-1-Factory policy of industrialisation. Thus far, seventy-nine (79) projects have been implemented under 1D1F, with another 35 going through credit appraisal by officials of the Ministry of Trade and Industry and the financial institutions that are supporting the programme. Under the Stimulus Package, two hundred and thirty-seven million dollars ($237 million) have been disbursed to 16 companies, with an additional thirty-five (35) being considered for support. The process of industrialization will be accelerated in the course of 2019. The possible creation of new regions – the first such exercise by democratic, constitutional means in our history – has made rapid progress, and, in a week’s time, voting will take place in the referenda to decide if we should have six new regions. I am grateful to the people who have put in all the hard work to bring us this far, and I trust that the new leadership of the Electoral Commission will pass well their first test of organizing a free, fair, transparent poll. I pray and expect that the voting will go off peacefully. There can be no excuse for any disturbance or violence. The people who seek new regions are not seeking to secede from Ghana – they are Ghanaian citizens who are seeking new administrative structures to guide their lives by a constitutionally-sanctioned process within the Ghanaian space. The Supreme Court has unanimously confirmed and validated the propriety of the process. Let us, then, leave them in peace to have their day, and see whether they can satisfy the high constitutional threshold for the creation of new regions. It is, of course, during times like these that we all realize what a great debt of gratitude we owe to our security services. As the policemen at a roadblock tend to say when you come across them in the night on your way home from an outing, they are being beaten by mosquitoes so we can be safe! No, I am not recommending you give money to the police on the road, but it is true that they keep us safe. I am happy that we are gradually being able to give them the tools they require to perform their duties. A few months ago, I presented the Police Service with two hundred (200) vehicles. The National Fire Service and other agencies are all being stocked. The exercise to recruit four thousand (4,000) young people into the Police Service is on, so that the increased numbers would make their work easier. The Ghana Armed Forces continue to perform their duty of guarding and protecting the integrity of Ghana. They have been in OPERATIONS CALM LIFE, COWLEG, HALT and AHODWO to maintain law and order. They have also participated in ‘Operation VANGUARD’ to reduce illegal mining and environmental degradation, and Operation ROADSTAR to construct a 40-acre Cattle Ranch to accommodate some six thousand (6,000) cattle at Wawase, Afram Plains, as part of the measures to stop the perennial nomadic headsmen menace. Already, four thousand (4,000) cattle are enclosed there. A legislative Instrument has passed Parliament that has increased the duration of the service years of the “Other Ranks” from 25 to 30 years. Construction is going on to deal with the housing needs of our Armed Forces. This year, as they have done consistently for more than forty years, the Ghana Armed Forces has contributed about two thousand, seven hundred and forty-six (2,746) men and women to serve in peace keeping efforts around the world. I am glad to see that the proactive measures being taken have helped to reduce the incidence of vigilantism associated with members of the ruling party. I am determined to stamp it out completely, as well as any other sources of vigilantism that may emerge. I have said that I have been busy and, indeed, apart from going around all ten regions of Ghana, I have also done quite a bit of travelling around the world to continue with the marketing of our country abroad. Quite a number of world leaders have also visited Ghana. The German Chancellor, Angela Merkel, was here, and so was the French President, Emmanuel Macron, and so was the Emir of Qatar, His Highness Sheikh Tamim bin Hamad Al Thani, and so was the heir to the British Throne, Prince Charles, and his wife, Camilla, the Duchess of Cornwall, and the Managing Director of the International Monetary Fund, Christine Lagarde, has also paid us, this week, a visit of encouragement. I believe all these interactions help to illuminate the progress we are making in Ghana. Government has increased the funding for the accountability institutions of our State, such as Parliament, the Judiciary, the Office of the Attorney General, CHRAJ and the Auditor General. 2017 witnessed a 12.2% increase in allocations to these five institutions over that of 2016. The financial endowment for the establishment of the Office of Special Prosecutor has also been made. I have no doubt that we will hear from the Special Prosecutor when he is ready. The institution of the Office of the Special Prosecutor does not mean that the Office of the Attorney-General no longer functions. Indeed, the prosecutions the Office has initiated in the last year and a half – the Republic vrs Stephen Opuni, Seidu Agongo and Agricult (GH) Ltd; the Republic vrs Ernest Thompson and Othrs; and the Republic vrs Baffoe Bonnie and Othrs – involve the alleged, willful loss or theft, in the period of the last government, of some GH¢556 million. This past year, the Office of the Attorney General has also been busy vigorously defending the state in many civil cases, and has won so many cases for government. I suspect the word has gone out that the government of Ghana is no longer the soft touch she was reputed to be. Every case brought against the government will be vigorously defended, and the days of easy judgement debts are over. We inherited a financial system that was under a considerable state of distress, with banks that were known to be insolvent as far back as 2015, and banks that had been licensed without the requisite capital. Some of these banks were surviving day to day only by virtue of liquidity support from the Bank of Ghana with the underlying problems that plagued them remaining unresolved. To protect depositors’ funds as well as to prevent contagion from these failed banks to the rest of the financial system, the new administration of the Bank of Ghana took some courageous measures in the public interest, to clean up the banking system and to put it on a stronger and more resilient path. There is no doubt that the failure of the seven banks came at a cost to the Ghanaian taxpayer and staff of the affected banks. However, the decisions taken by the Bank of Ghana and the financial support Government provided through the establishment and funding of Consolidated Bank Ghana Limited, ensured that deposits of more than 1.5 million customers with deposit values of over GH¢10 billion and about 70 per cent of the 5,000 jobs in the affected banks were saved. This was important to alleviate the severe adverse outcomes that could have occurred. It is important that the costs of these interventions, which were borne by taxpayers, are recovered to the extent possible through recoveries from debtors, shareholders, and related and connected parties who took money from the defunct banks. The receivership processes are ongoing, and the receivers are making great strides in their recovery efforts. Amounts in excess of GH¢400 million have so far been recovered by the Receivers of the 2 banks closed last year. The Government has set up a Special Investigations Team to undertake criminal investigations into the failures of all seven banks for possible prosecutions by the relevant State agencies. No one found complicit will be spared. The Bank of Ghana is conducting its own internal investigations into the conduct of its officials (past and present) that could have facilitated wrong doing at these banks. At the same time, the recapitalisation efforts by banks have been very successful so far, with about twenty-two (22) banks already meeting the new minimum capital of GH¢400 million well in advance of the 31st December deadline. The twenty-two (22) banks that have met the new requirement include a good number of indigenous banks. A few others are in the final stages of meeting this requirement. I am confident that at the end of the exercise, we will have a stronger, more resilient banking sector with a strong indigenous presence, well-positioned to finance the next phase of our agenda of economic growth. The interest of major oil companies in Ghana has become dramatic. Today, oil companies such as the American giant, ExxonMobil, and the Norwegian conglomerate, Aker, have signed petroleum exploration agreements with Ghana. Through the launch of the “GHANA OIL AND GAS LICENSING ROUNDS 2018”, the bidding process for the allocation of new petroleum rights to prospective investors, the first such exercise in our history, other global players such as BP, CNOOC Group and Total have expressed interest in coming to Ghana. We anticipate, as a result, an increase in crude oil production from the current 200,000 barrels per day to 500,000 barrels per day in the medium-term, and to 1 million barrels per day in the long-term. The Ghana National Petroleum Company, on its part, is conducting a geochemical analysis, and will soon start a 2-dimensional seismic survey over the northern and southern sectors of the Voltain basin. Successful results of this survey will pave way for exploration and drilling activities to begin. This year is an important one in the economic history of Ghana. We are about to exit, at the end of the year, from our 17th IMF programme since we joined the institution. We are doing so on a good note, and expect that the two remaining reviews in January and April next year will be completed successfully. The presence here, earlier this week, of Madam Christine Lagarde, the Managing Director of the IMF, who expressed clearly her support of the current management of the economy, is, in this regard, a good omen. The most important lesson that we must derive from our IMF experience is that we cannot afford, any longer, any disarray in our public finances, the reason for our demand for IMF assistance. Government will legislate, in this meeting of Parliament, a fiscal rule that will cap permissible fiscal deficits at a maximum of 5%, and a debt-to-GDP ratio of a maximum of 65%. It is my intention to anchor the implementation of this fiscal rule that will provide stability to our economy, by establishing a Presidential Advisory Fiscal Council, composed of eminent Ghanaian economists, who will provide independent advice to the President on how to comply with the fiscal rule. We have everything to gain from discipline. It is the foundation for sustainable, rapid growth of the economy. As you can see, a great deal of work is being done in so many areas, so that we can turn our back on our recent era of failure, and set our country on the path of sustainable, rapid development and growth. I am excited about the prospects for Ghana, and I invite you to share in this excitement, which will see the Black Star shining brightly again.